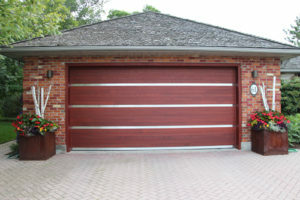 Oxford Carriage Door Ltd. is a proud dealer of Sansin environmentally-friendly wood stains and sealants. For over 25 years, Sansin’s penetrating stains have set the standard in wood protection. And because all Sansin Enviro Stains are low in VOCs, not only are they better for the environment – they’re better for our customers too. 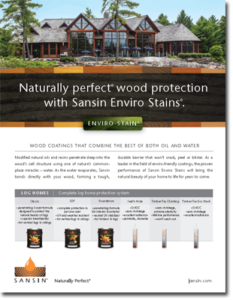 The Sansin family of wood protection products includes stains and sealers for log homes, siding, decks, interiors, cabinetry and floors. Thanks to a unique water-borne formula, Sansin Enviro Stains use water to carry oils and resins deep into the wood, forming a monolithic bond that won’t crack, peel or blister. Sansin provides exceptional protection against moisture, water damage, harmful UV rays, and insects. 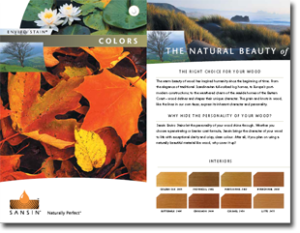 Sansin also offers the largest range of colours available in a stain, with over 70 beautiful tones inspired by nature – as well as the option of custom colours. New Eco-Tones™ colour technology ensures stunning purity and clarity. 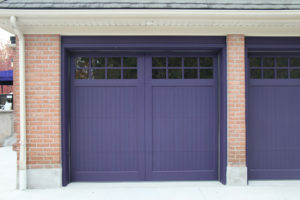 Oxford Carriage Door Ltd. stocks Sansin products for retail sale. 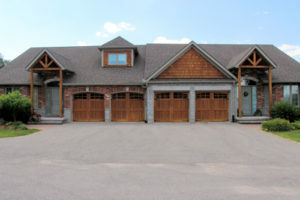 For your next siding, deck, fence or furniture project, contact us or visit our Stratford, Ontario location. Sansin stains are available in a wide range of rich wood tones and vibrant colours, a few examples of which can be seen to the left. For more information, we invite you to review the Sansin brochures below.